Abstract : Keloid is a difficult-to-treat condition and an ideal treatment modality is not available. Carbon dioxide (CO 2 ) laser is one of the modalities to treat keloids. Aim : To evaluate the effect of CO 2 laser ablation followed by intralesional steroids on keloids. Settings and Design : This was a prospective, single-center, uncontrolled, open study. Materials and Methods : Twenty-eight patients having 35 keloids were included in the study. Keloids were ablated or excised with CO 2 laser followed by intralesional steroid 3-4 weeks apart for 6 months. Results were evaluated after 6 months of stopping of intralesional steroids. Statistical Analysis : Fisher's exact test was applied for obtaining difference in recurrence rate of regular and irregular patients. Results : Thirteen patients followed up regularly for intralesional steroids. During 6 months of follow-up after stoppage of steroids, only two patients showed recurrence. Ten patients were irregular for intralesional steroids and seven of them showed recurrence. Difference in recurrence rate of regular and irregular patients was significant. Conclusion : Only CO 2 laser ablation is not sufficient for halting the pathogenesis of keloid formation.We therefore conclude that CO 2 laser followed by intralesional steroid is a useful therapeutic approach for the treatment of keloids; however, patients need to be observed for recurrence over the next 1 year. Keloids are benign hyperplasias which may or may not be preceded by injury. They are refractory to treatment most of the times. Intralesional corticosteroids,  topical retinoic acid,  topical imiquimod cream,  surgery,  cryotherapy,  laser  and silicon sheeting  are mainly used for their treatment. We assessed the effect of carbon dioxide (CO 2 ) laser ablation followed by intralesional steroid on 35 keloids of 28 patients. Twenty-eight patients having 35 keloids were included in the study. A detailed clinical history and examination were done for each patient. Diagnosis of keloid was done on clinical basis. Size of each keloid was noted with the help of a scale. The patients with keloids of size less than 10 cm in any dimension, any duration and with or without any treatment taken in the past were included in the study. However, patients of age < 12 years, pregnant females and infected or secondary changes on surface of keloid (e.g., excoriation/ eczema) were not included in the study. Written informed consent was taken. Photographs were taken on every follow-up e.g., after 3-4 weeks. The CO 2 laser machine used (model no CL20, Sunny Optoelectronic Co. Ltd, Shanghai, China) has continuous, repetitive and super-pulse mode. Energy per second (power) ranges from 0.5 to 15 W. Field block anesthesia (2% lignocaine with epinephrine 1:200000 infiltrated around the margins of the keloid) was given prior to the procedure. Patients were treated on the basis of the size of lesions. Smaller lesions were vaporized using super pulse with 15 W power. Larger lesions were treated in single or stagewise manner by multiple puncture technique or by excision. In multiple puncture technique, small full thickness punctures were created throughout the keloid tissue with a gap of 1-2 mm between the two punctures by CO 2 laser. Super pulse (for firm keloid) or continuous (for hard keloid) mode was used with 15 W power [Figure 1]. In excision, keloid tissue was excised from base with super pulse (for firm keloid) or continuous (for hard keloid) with a power output of 15 W [Figure 2]. Keloid was ablated till upper reticular dermis, indicated by yellow to light brown (faun) color change. Orally, 500 mg of tab amoxycillin with 125 mg clavulanic acid was given two times a day for 7-14 days depending on the healing of the lesion. Topically mupirocin cream was given till the healing of the lesion. Patients were advised to maintain proper hygiene of the wound till complete healing. Patients were evaluated weekly for 1 month to assess the wound healing. Injection triamcinolone acetonide 40 mg/ml was infiltrated around the margins just after surgery and again after a gap of every 3-4 weeks for 6 months. For the first two visits, dose of intralesional triamcinolone acetonide 40 mg/ml was 2 U (0.050 ml) of insulin syringe was injected per cm 2 area and after that the steroid was injected only at the places where itching or pain or reappearance of keloid tissue (surface elevation) was present. Detailed examination was done after 3 and 6 months of the surgery and size of keloid tissue with local and systemic side effects of corticosteroid were noted. After that, patients were followed up to look for recurrence. Patients were categorized as satisfactorily treated, if there was a thin scar (parchment like) or supple texture and no surface elevation, absence of pain/pruritus and absence of tracts. If not, patient was considered as treatment failure. A total of 28 patients with 35 keloid lesions were treated with CO 2 laser followed by intralesional triamcinolone acetonide injection infiltrated at the margins of treated keloid. Nineteen (68%) were males and nine (32%) females. Twenty-eight keloids were on chest, one was on ankle, three were on right flank, one was on abdomen, one was on left arm and one was on lateral side of right thigh. Seventeen keloids (51.42%) were asymptomatic; however, 17 (45.71%) had itching and pain and one (2.85%) had only pain as symptoms. After 21 days of CO 2 laser ablation, healing with erythematous scar tissue was seen in 33 keloids (94%); however, two keloids became secondarily infected and hence healing was delayed. There was no or minimal pain after 7 days of procedure. Thirteen patients with 17 keloids came for follow-up regularly and completed the protocol and took upto eight intralesional triamcinolone acetonide 40 mg/ml 3-4 weeks apart. Only two patients showed recurrence, one with marginal elevation and another with 70% recurrence. Rest 11 patients having 15 keloids showed complete flattening without any recurrence after a follow-up of 1 year [[Figure 3]a and b], [[Figure 4]a and b]. Eight keloids showed no local side effects of intralesional steroid, three developed telangiectasias, five developed depigmentation and one developed atrophy. Intralesional steroid dose, which was 10 U (1 ml=40 U of insulin syringe, 1 U=0.025 ml) or 0.25 ml of 40 mg/ml of injection triamcinolone acetonide on an average at first two follow-ups, decreased to an average of less than 2 U or 0.050 ml of injection triamcinolone acetonide at the end of 6 months period [Figure 5]. Ten patients with 12 keloids did not come for follow-up regularly for intralesional steroid and hence did not complete the protocol. 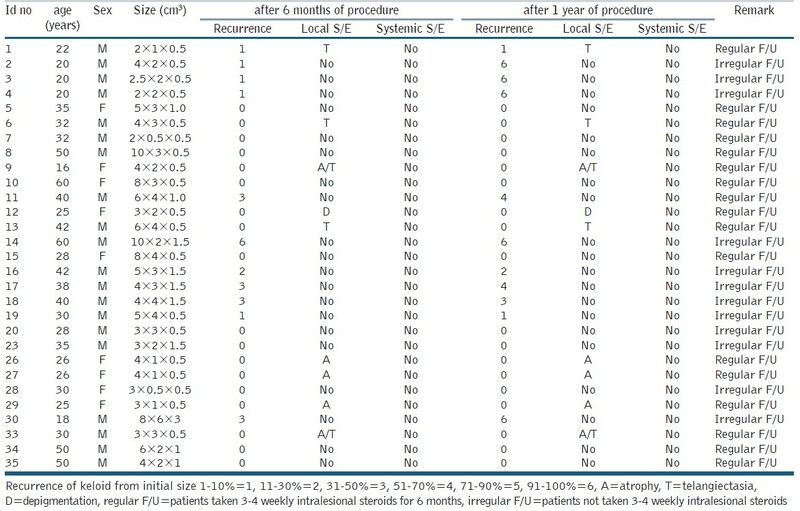 In this group, three keloids did not show any recurrence, five keloids showed 100% recurrence and remaining four keloids showed 10-70% recurrence after 1 year of follow-up [Table 1]. An average of three doses of intralesional steroids was taken by these irregular patients in comparison with eight doses of intralesional steroids of regular patients. Five patients were lost to follow-up. We compared the results of regular follow-up patients with the irregular follow-up patients who had not taken intralesional steroid 3-4 weekly as the study does not have a control group. Data was entered in a 2Χ2 table. Because the values were less than 5, we applied Fisher's exact test for p-value. p-value was 0.0008976 (<0.005) which was significant (degree of freedom=1). Symptomatic relief was noted in most patients who took intralesional steroid regularly. Secondary complications were mild-to-moderate, manageable and acceptable to patients. Intralesional steroid injections during follow-up visits were found to be relatively painless probably because they are delivered in periphery or in soft-to-firm reappearing keloid tissue. We used the same approach and found that the patients who were regular for follow-up and took intralesional steroids at every 3-4 weeks for 6 months had complete flattening of keloid tissue. There was no reappearance of keloid tissue after a follow-up of 6 months of therapy in 11 patients with 15 keloids who were regular and completed the protocol. There was no or minimum pain after 7 days of procedure. Wound healed with erythematous scar tissue within 3 weeks of procedure. Since we did not have a control group, we only compared the results of patients who followed up regularly and took intralesional steroid injections every 3-4 weeks with those who did not. We found that the difference in recurrence rate of regular and irregular patients was statistically significant. This indicates that only CO 2 laser ablation is not sufficient for halting the pathogenesis of keloid formation. It requires regular 3-4 weekly intralesional steroid for a period of 6 months after ablation with CO 2 laser. Ablation with CO 2 laser followed by regular 3-4 weekly intralesional steroid for 6 months, is a satisfactory approach for keloid management. Recurrence rate in the first 6 months is low. Further studies with larger number of patients and longer follow-up are required to further assess efficacy of CO 2 laser with intralesional steroid in treatment of keloids. 1. Maguire HC Jr. Treatment of keloid with triamcinolone acetonide injected intralesionally. JAMA 1965;192:325-6. 2. Janssen de Limpens AM. The local treatment of hypertrophic scars and keloids with topical retinoic acid. Br J Dermatol 1980;103:319-23. 3. Berman B, Kaufman J. Pilot study of the effect of postoperative imiquimod 5% cream on the recurrence rate of excised keloids. J Am Acad Dermatol 2002;47:209-11. 4. Cosman B, Wolff M. Correlation of keloid recurrence with completeness of local excision: A negative report. Plast Reconstr Surg 1972;50:163-6. 6. Apfelberg DB, Maser MR, Lash H, White D, Weston J. Preliminary results of argon and carbon dioxide laser treatment of keloid scars. Lasers Surg Med 1984;4:283-9. 7. Gold MH. Topical silicone gel sheeting in the treatment of hypertrophic scars and keloids. J Dermatol Surg Oncol 1993;19:912-6. 8. Reid R. Physical and surgical principles governing carbon dioxide laser surgery on the skin. Dermatol Clin 1991;9:297-316. 9. Apfelberg DB, Maser MR, White DN, Lash H. Failure of carbon dioxide laser excision of keloids. Lasers Surg Med 1989;9:382-8. 10. Sinclair RJ, Sinclair PJ. Carbon dioxide laser in the treatment of cutaneous disorders. Australas J Dermatol 1991;32:165-71. 11. Wheeland RG, Walker NP. Lasers-25 years later. Int J Dermatol 1986;25:209-16. 12. Wheeland RG. Clinical uses of lasers in dermatology. Lasers Surg Med 1995;16:2-23. 13. Hobbs ER, Bailin PL, Wheeland RG, Ratz JL. Superpulsed lasers: Minimizing thermal damage with short duration, high irradiance pulses. J Dermatol Surg Oncol 1987;13:955-64. 14. Norris JE. The effect of carbon dioxide laser surgery on the recurrence of keloids. Plast Reconstr Surg 1991;87:44-9. 15. Stucker FJ, Shaw GY. An approach to management of keloids. Arch Otolaryngol Head Neck Surg 1992;118:63-7.